Clean the chicken pieces and marinate it with 2 tsp kasmiri chilli powder, 1 tsp ginger-garlic paste, 1/4 tsp turmeric powder, 1/4 tsp pepper powder, lime juice, 1/2 tsp garam masala and salt and keep it aside for 15-20 minutes. 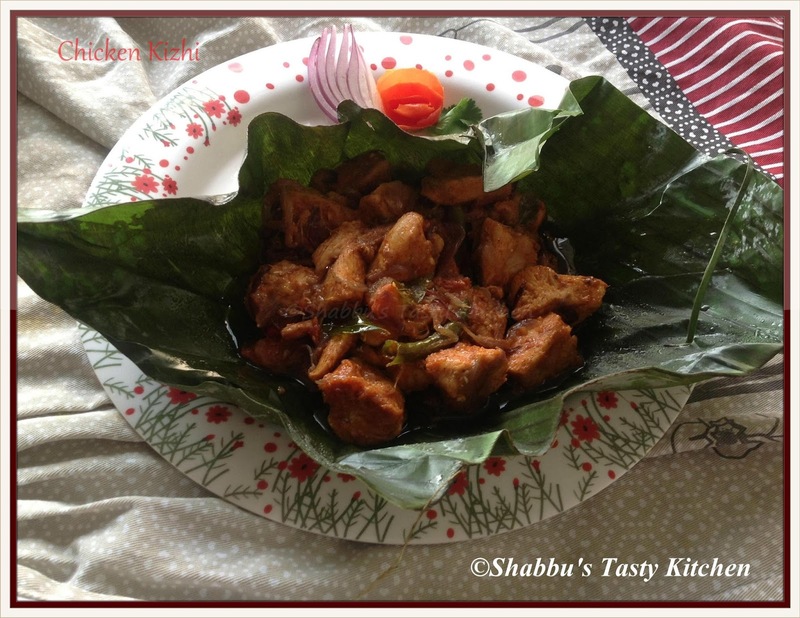 Heat 2-3 tbsp oil in a pan and add marinated chicken pieces and shallow fry / tawa fry it. Add 2 slit green chillies and few curry leaves to this and fry it in the low flame till chicken is cooked. In the meantime, heat little oil in another pan and add sliced onion, 1/2 tsp ginger-garlic paste, 2 slit green chillies, few curry leaves and salt and saute well till light brown. Reduce the flame and add 1/4-1/2 tsp kashmiri chilli powder, 1/2 tsp coriander powder,1/4 tsp pepper powder, a pinch of turmeric powder and 1/4 tsp garam masala and mix well. Remove it from flame and add this masala to the cooked chicken (in the other pan) and mix well for 2-3 minutes. 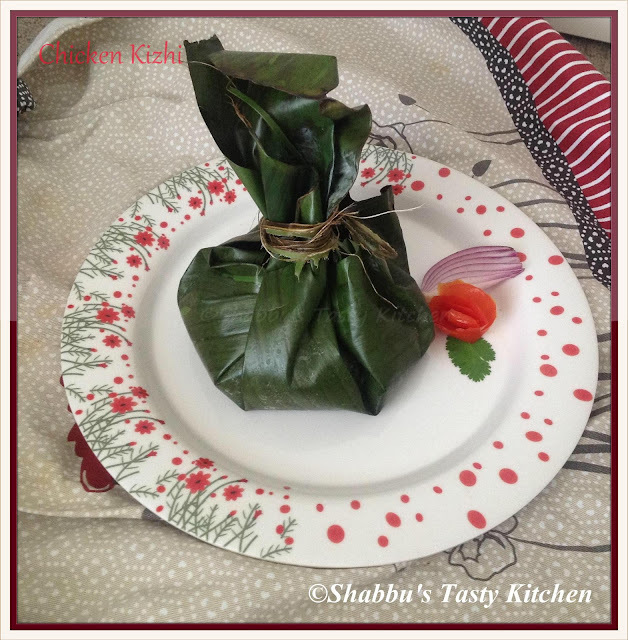 Wilt the banana leaf and place the prepared chicken masala in the centre and hold all the edges of the banana leaf together like a kizhi and tie the top edge of the kizhi tightly using a thread or with a banana leaf stem fiber. This is really nice and healthy option. This must have tasted so good.Simply good one.